Osmio EZFITPRO-300 Ultracarb and Fluoride Water Filter System - 15mm Push Fit The Osm..
Osmio EZFITPRO-100 Undersink Water Filter Kit The Osmio EZFITPRO-100 Unders..
Osmio Active Ceramics Small Whole House Filter System The Osmio Active Ceramics Small W..
Osmio PRO-II-XL Advanced Whole House Water Filter System The Osmio PRO-II-XL Adva..
BMB-10 +Alkaline +Detox is a standing, full functioning non pumped reverse osmosis water filter system. 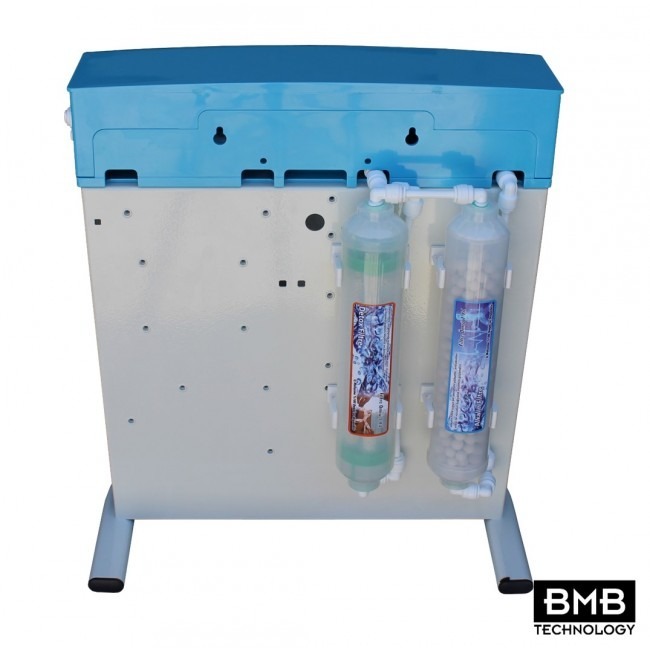 The system comes with a steel stand for easy installation, plus the pH stabilizer, antibacterial, alkaline and detox filters. 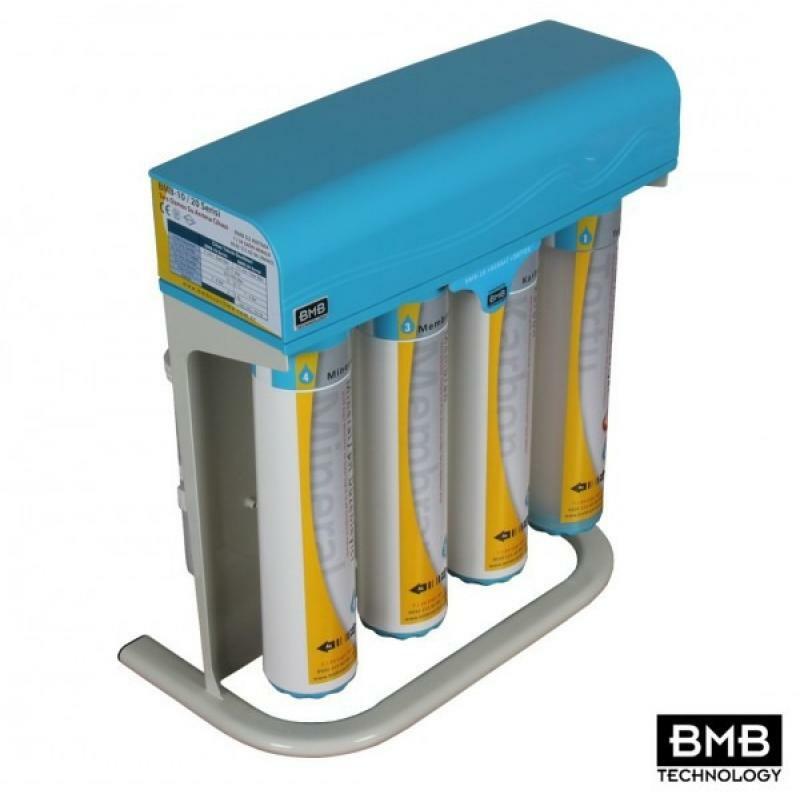 The 6 filter system incorporates nano technology filters, easy Plug & Play components and Quick Change Filter Technology (QCFT) for easy maintenance. The first and second stage pre-filters are infused with Zinc nanoparticles that activate in water for antibacterial properties. 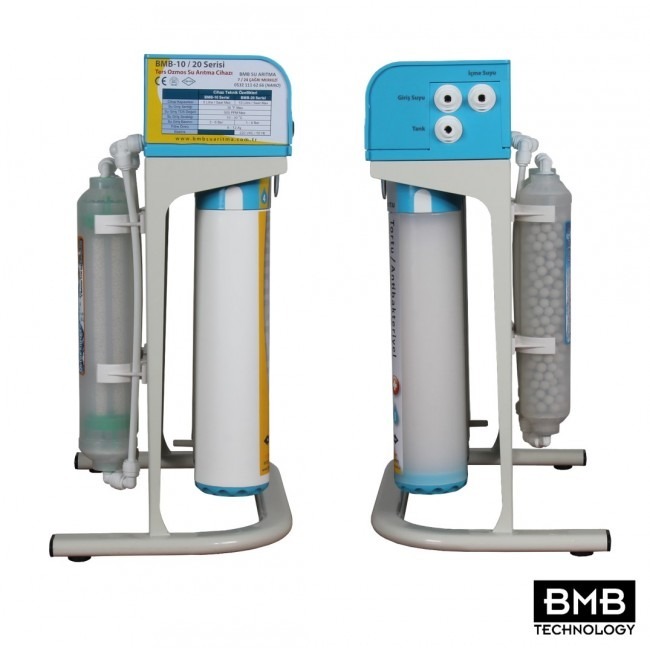 The third stage reverse osmosis filter is composed of a semi-permeable membrane with 0.1 nano-meter sized pores. These pores can remove hundreds of thousands of different types of chemicals and compounds notwithstanding 99.99% of microorganisms. The fourth stage mixes magnesium with purified water on an atomic scale to bind up free hydrogen atoms. This binding process increases the purified water pH with natural minerals to give it a very healthy polish. 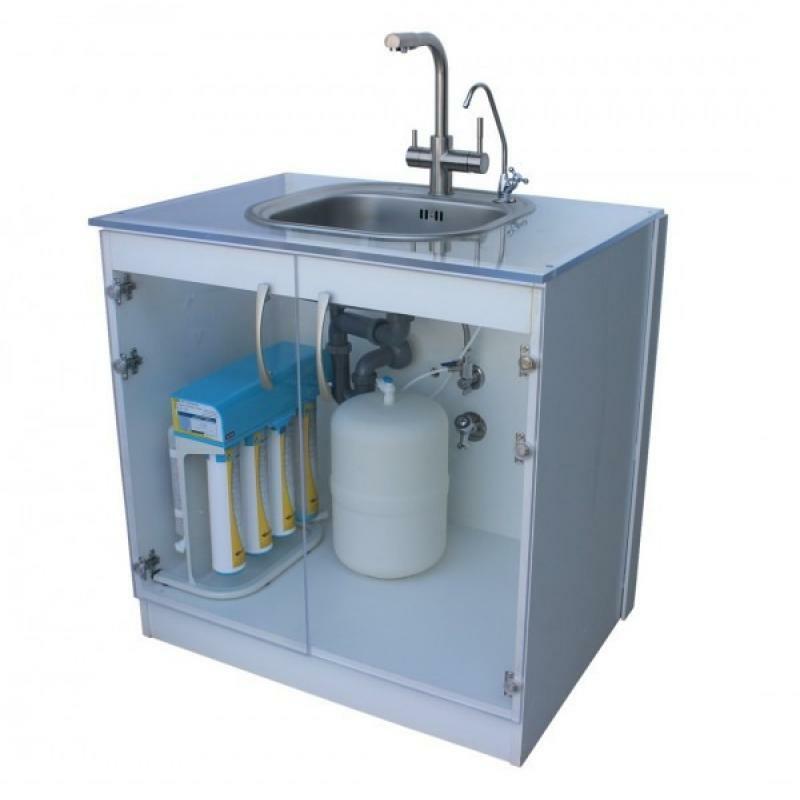 The system also includes extra stages to enrich the purified water. 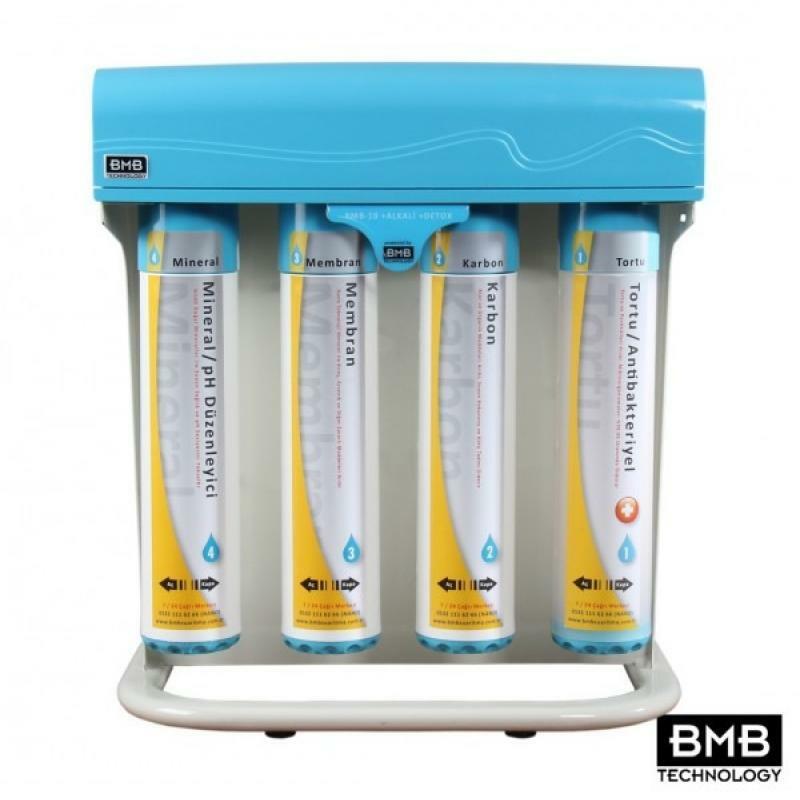 The fifth stage alkaline filter uses a special blend of minerals high in nutritional value to naturally increase the water pH. The higher ph water, which will have alkaline properties, can help in fat burning, body acid neutralization, better blood flow. The sixth stage detox filter uses Tourmaline mineral crystals to generate Far Infrared Rays (FIR). As the water passes through the FIR field, some of it will become activated to restructure the water into smaller molecular clusters. The process can ultimately assist in the hydration of the human body. 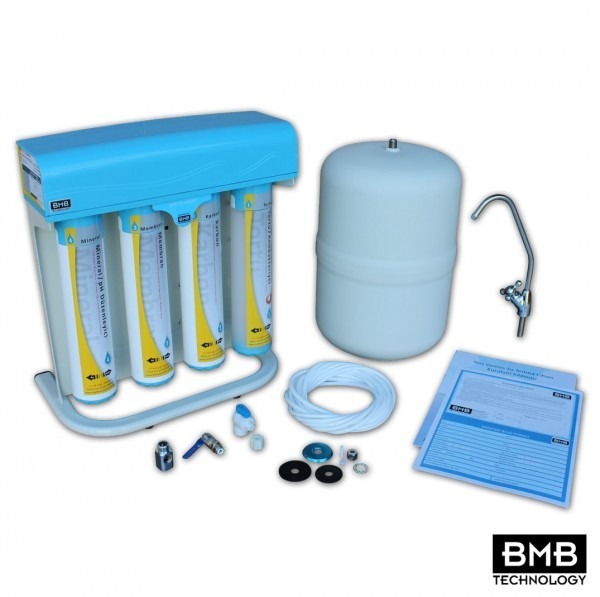 BMB-10 +Alkaline +Detox is designed for use in residential (for home) drinking water applications. The system is installed under the kitchen counter with a secondary faucet installed on the sink. Alternatively the system can be used with a 3 way tap to combine hot, cold and healthy filtered water into a single kitchen tap. The system is an economic model which requires a minimum incoming mains pressure of 45 psi or 3 bar and which is best utilized in homes with 20-50 Litres of daily, purified, drinking water consumption. 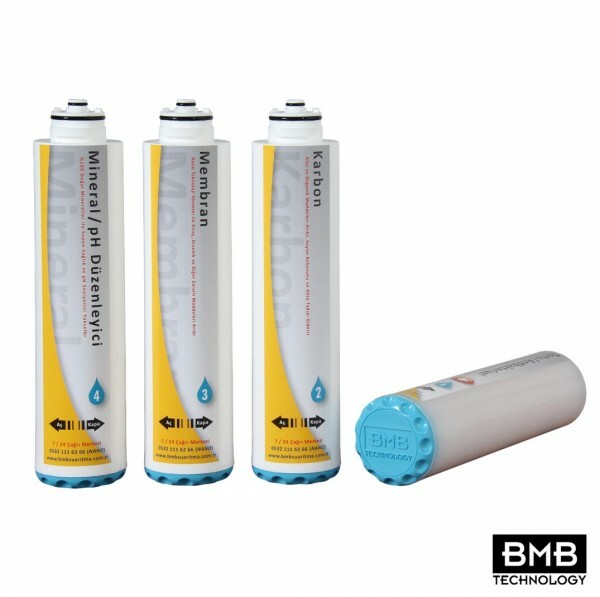 If you are in a home with less than 3 bar or in a flat then it is recommended to use the BMB-20 model which has the booster pump built in and a standard UK plug which ensures the system will have enough pressure to produce well and minimise waste. Incoming Hardness: 35 oF Max. Incoming TDS: 600 PPM Max. Incoming Pressure: 3 Bar Min. 6 Bar Max. System Dimensions: 21 (L) x 36 (W) x 51 (H) cm. Tank Dimensions: 23 (L) x 23 (W) x 35 (H) cm. Comes installation ready complete with everything required to install it and a clear step by step easy to follow manual! Full Set of Quick Change Filters for BMB-Nano Compatible with BMB N..
Full Set of Quick Change Filters for BMB-10 and BMB-20 Compatible with BMB ..
Osmio Memphis Long Reach 3 Way Tap - White The Osmio Memphis Long Reach..
Osmio Premium Ciri Modern Chrome 3-Way (Tri-flow) Kitchen Tap The Osmio Premiu..